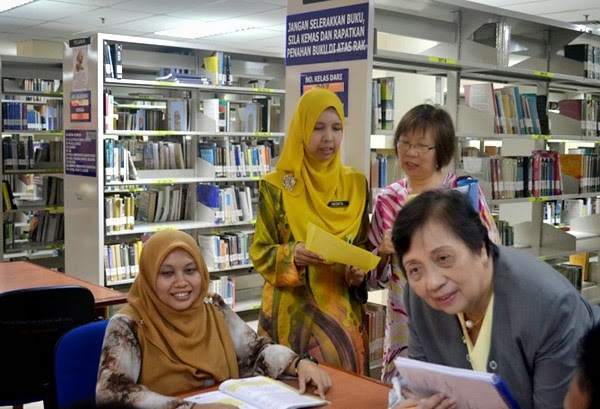 As part of its efforts to intensify its quality assurance advocacy in the Asia Pacific region, the Asia-Pacific Accreditation and Certification Commission (APACC) embarked on an onsite visit to the Politeknik Sultan Ahmad Shah (POLISAS) in Kuantan, Pahang, Malaysia from March 17 to 19, 2015. This is the first of the planned four onsite visits in the country that is slated to happen for the month. POLISAS is a public Polytechnic institution established in 1976 under the Department of Polytechnic Education (DPE), Ministry of Education, Malaysia. The institution covers a total of 974,633.3 sq. meters in which 75% or 730,975 sq. meters is built-up. It offers a total of 11 courses with duration of three years. As of this year, it enrolls 6,400 students and employs 491 full-time faculty and 134 full-time staff. The institution is currently headed by Director Mejar (K) Dato' Haji Abu Bakar Bin Ahmad. The vision of POLISAS is to be the leading provider of innovative human capital through transformational education and training to fulfill the needs of global workforce and it plans to execute this through its mission of pushing the boundaries in creating transformative and creative education environment to achieve innovation led economy. The APACC team assigned to this accreditation exercise included the team leader and APACC key person, Dr. Romulita Alto from the Philippines and the team member and APACC accreditor, Dr. Paiboon Saiyawongs from Thailand. Mr. Rae Emmanuel Echaveria, APACC staff and Ms. Nabil bt. Yaacob, APACC Local Staff, also assisted the APACC operations as part of the secretariat. Pn. Noor Aidi Nadzri, Director of Instructional and Digital Learning Division of DPE and the APACC National Coordinator for Accreditation in Malaysia, was also present to oversee the activities in POLISAS. The whole event was also graced by the presence of the Director General of Colombo Plan Staff College (CPSC) and the President of APACC, Dr. Mohammad Naim bin Yaakub, the Director General of the Department of Polytechnic Education, Datuk Hj Mohlis Bin Jaafar and the Deputy Director (Strategic) of the Department of Polytechnic Education, Tn.Shabuddin Man. They personally went to POLISAS to witness the successful preparation and implementation of the onsite visit activities. The APACC team was welcomed in a full military fashion by the POLISAS administrators led by Director Abu Bakar and the rest of the POLISAS administration through the Deputy Director of Academic Affairs, Pn. Shamsuria binti Mohd Ariffin, the Deputy Director for Academic Support, Tn. Che Alias bin Mohd Yusof and the rest of the POLISAS administration and staff. They were also led to witness the latest innovations that the institution has embarked through the years such as the robot developed by the institution which has recently won awards in competitions outside Malaysia. During the opening ceremony, Dato Haji Abu Bakar provided comprehensive information about POLISAS particularly on its history, facilities and services offered to its stakeholders. He also expressed his appreciation to the efforts of the whole institution in their preparation for the event. In her opening speech, Dr. Alto cited a few words about the importance of institutional management and cooperation in TVET institutions and highlighted the role that APACC plays in assisting institutions reach their desired objectives through the improvement of their services to the stakeholders. Dr. Paiboon, meanwhile, validated the need to reach for a higher institutional status through a third-party review of the present situation of the institution. The accreditors reviewed the claims of the institution viz-a-viz the questions in the APACC Self-Study Report (SSR) through a thorough audit of their documents, files and facilities. They also visited the facilities of POLISAS such as the library, student center, mini-clinic, gymnasium, dormitories, classrooms, administration offices, food laboratories and engineering workshops. They also interacted with the students and faculty of POLISAS and inquired about the innovations that they have developed, particularly in the food technology, engineering and architecture. The institution was evaluated based on the following criteria: (1) Governance and management; (2) Teaching and learning; (3) Faculty and staff; (4) Research and Development; (5) Extension, consultancy and linkages; (6) Resources and (7) Support to Students. Through the cooperation of the faculty and staff of POLISAS, the conduct of the on-site visit became a successful event that is a testament of the Malaysian TVET institutional excellence.